I didn’t know the country of Lesotho existed before I began researching for my trip to Africa. And you can’t blame me. It’s a tiny landlocked country within South Africa; the country asked for British protectorate status when the Dutch were threatening to invade decades ago. 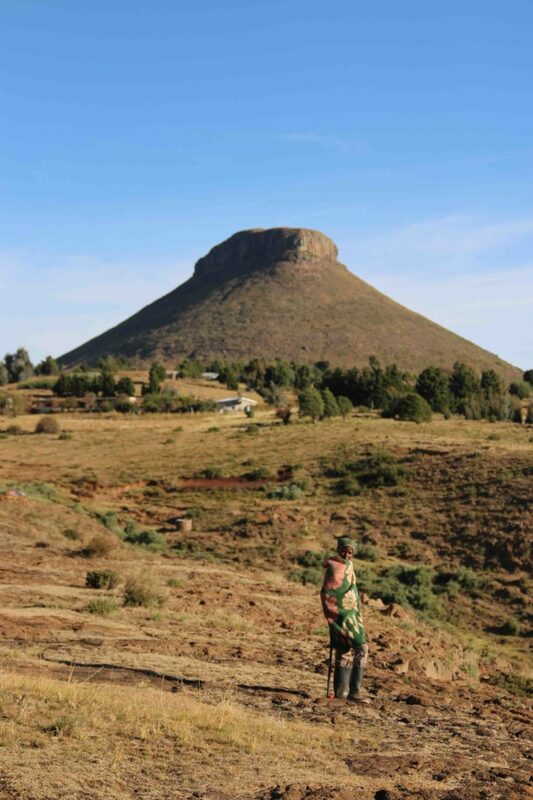 It’s roots are San bushman and immigrants from the north of Africa; their first King, Moshoeshoe was the king of the Basotho people and the founder of the nation. It’s unlike any place I’ve ever been. While riding we brought our passports. Why? If something major happens to you, you most likely have to head to South Africa because Lesotho’s hospitals aren’t equipped for major injuries. And if you need the cops, you have to pick them up: cops got no wheels of their own. And coming from former apartheid South Africa, I don’t feel the residual animosity from apartheid. Lesotho is poor, but rich in minerals and natural resources. Diamonds and water. It is the largest water supplier to South Africa. But for the average Basotho, herding animals (sheep, cows) is the mainstay. It’s a beautiful sight to cycle through the canyons with a shepherd wrapped in a traditional blanket watching his flock. Called Kingdom of the Sky, the entire country is wide open canyons and valleys. Very Utah-like. My first ride we climbed to the top of a canyon and crossed over dinosaur prints in the rocks. Since locals ride the unbelievably sure-footed Basotho pony’s (these horses are like mountain goats! ), the entire country is a natural network of trails. We rode with Christian Schmidt, the founder of the six day stage race, Lesotho Sky, and a local named Boteng, who is opening a bike shop in Roma: “I only began riding a few years ago but I love it.” Boteng was actually a mechanic at the Joberg2c race. I stayed in the town of Roma, at the Roma Trading Post Lodge (which has been a trading post since 1903). Christian and partner of Lesotho Sky, Darol Howes, manage the property as a hotel now; well, it’s cabins with a communal kitchen. 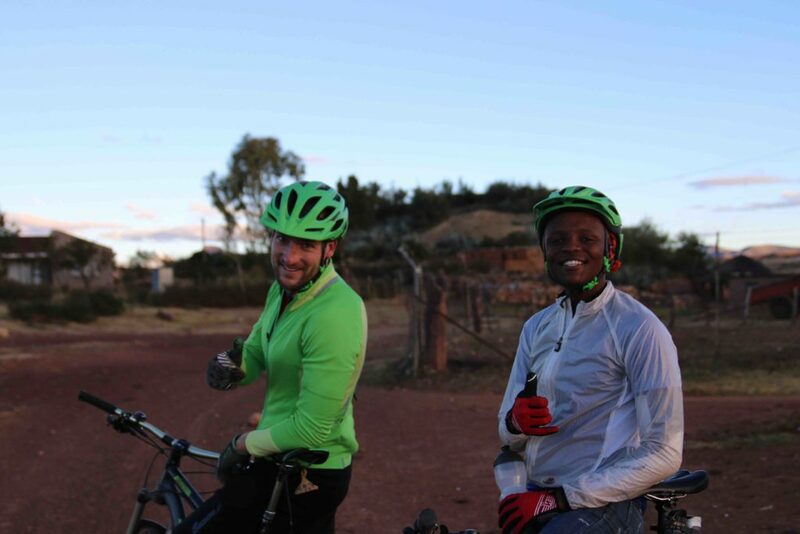 Since leaving Germany, (his family lived in Lesotho as a kid) Christian has made his life mission developing and promoting the riding in Lesotho with Darol, the race director. The first year (2011) the race had 22 riders; this year about 100. “we don’t want it to get larger than that…it’s intimate and special if it’s smaller.” Joberg2c has over 800 riders. It’s like a dinner party verses a concert. I also met an amazing German couple, Lena went to the same school with Christian in Germany. The family, and her husband Reuben, and three year old adorable Emily, were here on vacation. The three of us did a Roma village tour that included a trip to a local woman’s house to sample her fine brew at 10 am in the morning! When I didn’t finish my glass, she shot the rest back in record time. We also visited the school, and community centre. 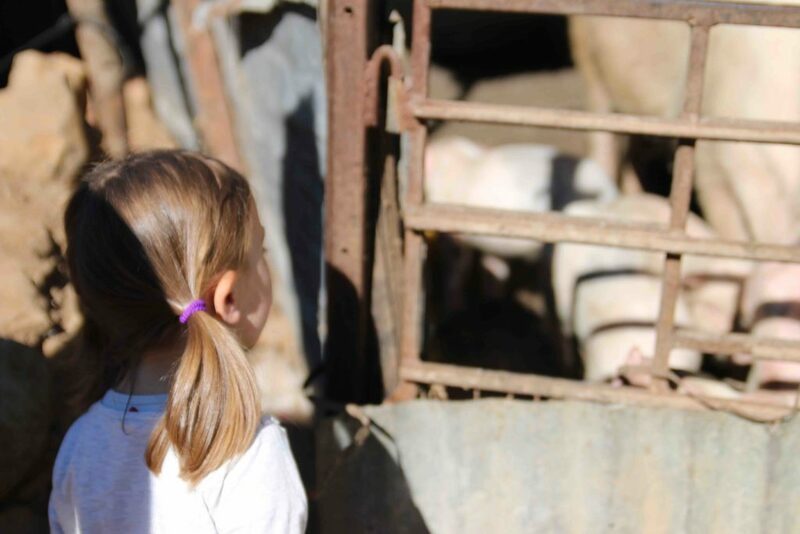 The kids gravitated to us, and especially Emily, who hid behind her parents’ legs! For lunch, we had wheat and beans in a local’s house. No spices; it was so creamy and hearty all on its own. We almost managed to finish off an entire mixing bowl of the stuff. Darol and Christian, along with Kay and their partners, live in the main house. On the first night I played some Daft Punk and Gotan Project, while we all made bits of a meal to share, and drank amazing South African wine (and tequila. Gulp). I’ll never learn. Mid week our entourage moved on to Semongkong to the south. 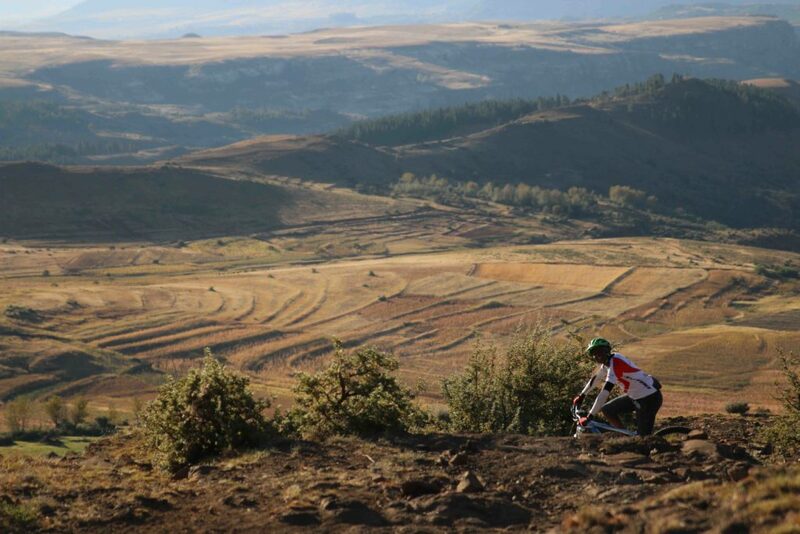 The Semongkong Lodge is the finish for the Lesotho Sky race. At the bottom of a valley and river, the terra cotta thatched roof lodge is serene. It’s fall now so the leaves are falling and the sunshine glitters off the river. Lena and Emily went horseback riding and the rest of us biked. 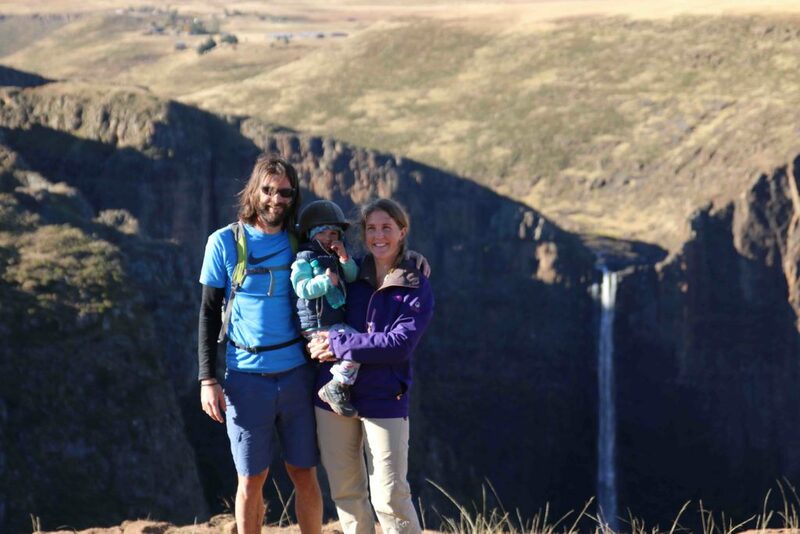 We all convened near the Maletsunyane waterfall, and a canyon that drops to infinity. That night we dine in style while sipping the local brew, Maluti. The chef from Cape Town made us some crayfish, pork belly with a variety of sauces finished with an apple tart with cream. On our final outing, we head further south to Malealea for a weekend of riding, and the annual Malealea Monster, which we’re reminded, is not a meander. “It’s meant to be hard, it’s called a monster for a reason,” says Michael, owner of the Malealea Lodge. Naturally, I had to enter. Malealea is a little town kinda in the middle of the country; the dirt road into the lodge, which peaks at the Paradise Pass 2001 meters, is a hellish rocky and rutty descent for a Toyota Corolla. Lena often got out of the car to navigate. The lodge is a little village of thatched cottages and beautiful protea flowers with colourful lanterns and murals of San bushman and flowers everywhere. A hippy vibe; a nypthm oasis. That night a local group of singers dance and invite us in. Well, OK! The music was so lively and happy, reminds me of ska. The next day’s race, I choose the 55km (25, 55 or 75). I came in at 4 and a half hours — but it felt neverending through rocky switchbacks, long gravel road climbs, and I could see the skin on my thighs turn redder and redder. 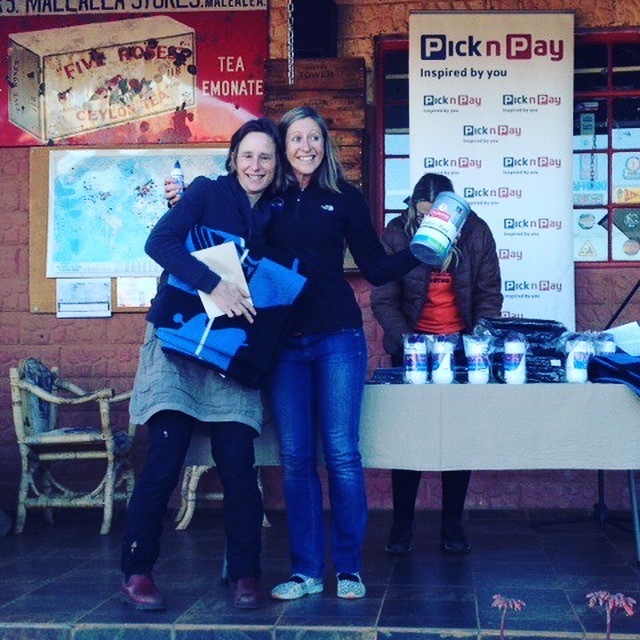 It was harder than any single day during the Joberg2c race. But when I heard the words, ‘and all the way from Canada, the winner…” Somehow this podium meant more than almost any others I’ve won because it happened in a place where you can see how the empowerment from a bike. A 16-year -old boy who was on the streets a few years ago won his first bicycle. He is one of dozens of street kids that found their way to Sepheo, a school founded by Australian Belinda Groves, and her husband. “He knows he can accomplish something now,” said Belinda. And my prize? A traditional Basotho blanket, like the one’s the shepherds wear. I’ll wrap it around me back home during the winter and think of Lesotho, the Trading Post gang, our dinners and week of doing what we love more than anything: riding a bike. I am an avid cyclist and love to see different countries on my bike. I never would have imagined cycling in Lesotho!